You'll be £12.00 closer to your next £10.00 credit when you purchase Dunkirk to the Rhineland. What's this? Charles (Charlie to his comrades) Murrell kept detailed diaries of his service with the 1st Battalion Welsh Guards throughout the Second World War as Guardsman (later Sergeant). This book starts on 10 May 1940 with the Blitzkrieg on Arras and the retreat to Dunkirk. The Dunkirk beaches and his own undignified evacuation are described in some detail and occasional humour. The second part begins on 20 June 1944 when the 1st Battalion Welsh Guards set sail for Normandy and they take part in the Battle for Caen with engagements at Cheux, Cagny and Colombelles and thence to the Bocage country with a particularly bloody fight at Montchamp. The final element covers the race for and liberation of Brussels, a fiercely fought engagement at Hechtel – Operation MARKET GARDEN, Nijmegen and the 'Island', winter in Belgium and Holland and the Rhineland Battle. As a member of the Intelligence Section, the Author was aware of the 'big picture.' Very observant he has a literary style or ability unusual in a ranker. He often writes in his trench whilst under mortar or shell fire and one experiences the fear that he (and millions of others) felt. He describes several near death experiences and the casualties and deaths of his comrades and other horrors of war, sometimes in graphic detail. There are descriptions of hair-raising motor-cycle rides, the fanaticism of the SS, the sadness of lettering crosses of his dead comrades, the ecstatic receptions in liberated villages and towns, culminating in the liberation of Brussels, the uneasy relationship with American troops, the importance of alcohol in his (and others) war and the joy of returning to England. The many sketches are an important accessory to the journals. C S Murrell trained as an artist but enlisted in the Welsh Guards in 1933. He served throughout the War (as told in this book). He later worked for the Ordnance Survey. He died in 1987. Nick Murrell (C S Murrell's son) lives at Pevensey, East Sussex. Nick Murrel has done a very fine job of editing Dunkirk to the Rhineland. His farther was called up as a reservist in June 1939, having worked for Ordance Survey, and he brought a keen eye for detail and the skills of a technical draughtsman to the task of keeping recording his wartime experiences. He is to be commended for ensuring his father's insights into the nature of war in a Guards battalion can ow be appreciated by a wide audience. It's not often that I read a book twice but this was one of them. I found the book a totally absorbing story, picking up different small details after each read, all which painted a very moving picture of a normal soldier in peace and war, his thoughts and fears. I recommend this book without hesitation, and would like to thanks Pen and Sword Books for the review copy. This book covers his experiences from the Blitzkrieg on Arras to the beaches of Dunkirk in 1940 and then the invasion of Normandy on D- Day 1944. It is a personal story of the authors experience at war, making his diary entries sometimes under fire. What adds to this fascinating diary is the authors own superb art work and makes this a powerful and exciting memoir. Edited by his son Nick Murrell who only discovered his fathers diaries after his death in 1987. 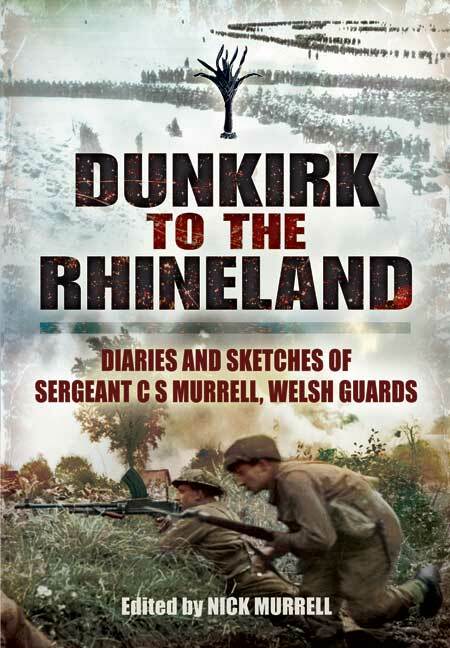 Dunkirk to the Rhineland is written using the diary and sketches of C S Murrell of the Welsh Guards, and as such is a first hand account of the major conflicts of the Second World War. Covering the blitzkrieg on Arras, the Dunkirk beaches and the battle for Normandy amongst others, this is a humble, humorous and unpretending, providing a fascinating read that is perfect for either the first time reader of this period, or the hardened veteran. Detailing the heroics of thrilling motor bike rides, intelligence information gathering and the reception of the liberated villages, it also covers the grisly fanaticism of the Nazis, the recovery of the dead and the sadness of loosing comrades in conflict. Illustrated with the author's own incredible sketches (which include equipment, vehicles - tanks etc - and people), it is easy to imagine the author writing his entries under mortar fire and in between combat - indeed the horrors of war are retold in gruesome detail as fitting with the level of detail in his other entries. In fact, this level of detail is so exceptional, the reader is often transported back in time and place to the author's location (whether this be in transport to a new locale, or in the trenches under enemy fire), completing the journey with him - from the (from his own admittance) undignified evacuation at Dunkirk to his joyful return home at the end of the war. Hard to put down and unmistakably a masterpiece of this genre, Dunkirk to the Rhineland is without a doubt a comprehensive and true account of the Second World War told by an ordinary soldier who could see "the bigger picture". Nick Murrell (C S Murrell’s son) lives at Pevensey, East Sussex.